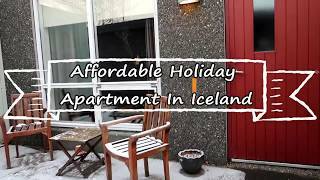 Cath is a family travel blogger over on Passports and Adventures. She is an Irish expat now living in Portugal after 15 years in the UK. A former scientist, she gave up working when they emigrated south from the UK. As a family they love travelling and have started working their way through their family travel bucket list. She hopes that, through her blog, they will inspire more families to travel, especially with the toddlers in tow. 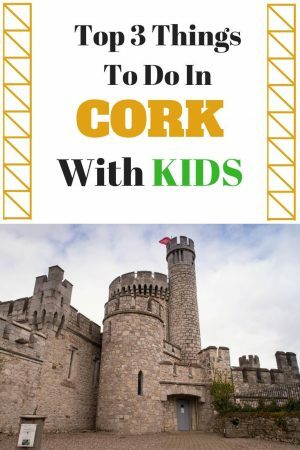 Cath is sharing what she thinks are the top 3 things to do in Cork with kids. Despite being from Ireland, I had never really explored the southern half of the country until I took my son on a road trip there over Easter 2018. My hubby was working, so my son and I flew to Ireland and explored the southern half of the country for a week before catching up with family in Dublin before flying back to Portugal. Cork was the third place on our road trip and, having never been there before, I did some research to see what we could do while in the area. My sister and niece were joining us, so finding kid-friendly things to do in Cork was a must. 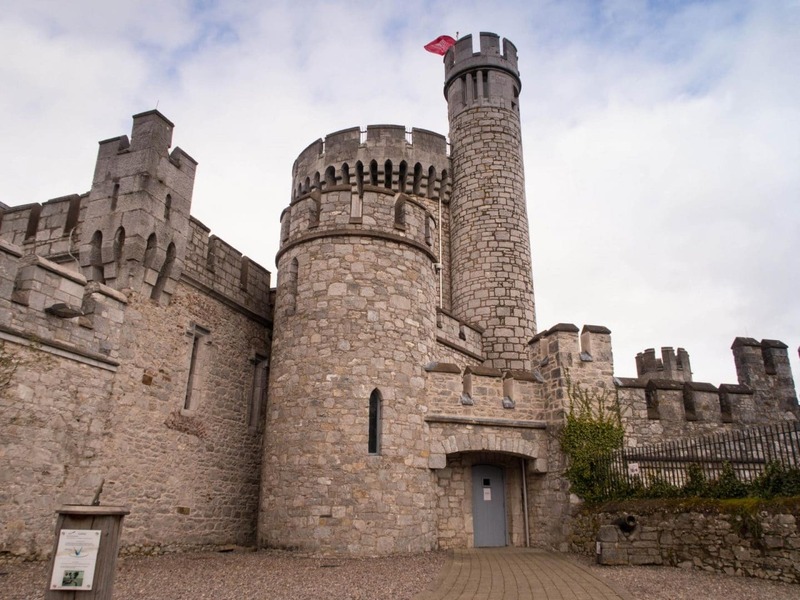 My son and I always try to visit castles wherever we go and we manged to fit in two castles as well as seeing some animals during our 3 days in Cork. We enjoyed each one of them and highly recommend them if you are in the Cork area of Ireland with kids. While researching castles in Ireland to visit with kids, Blackrock Castle popped up. And while it may look like a castle from the outside, it’s not your typical castle inside. Sitting on the banks of the River Lee, it was developed in the 16th century as a coastal defence fortification for Cork Harbour. And while it was a castle of sorts for many years, it is now a museum and science observatory. There are interactive displays about the universe, the cosmos and about how life started and developed over time. There are daily talks about the history of the castle during which you can climb the tower to the top and take in the views across the River Lee. You can also peek into the observatory, although you cannot enter it. You can visit what was the armoury too. There is also a planetarium to visit, although we didn’t get a chance to enjoy it during our visit. And, if the weather permits, there is a lovely café there to enjoy a cuppa while the kids explore the small courtyard. It’s not a very big castle but you can easily spend an hour or two there, especially if you join one of the talks. Parking is free along the river banks and there are toilets and a café for visitors. It’s a great way to see how modern life co-exists with the old and to learn about the universe and where we came from at the same time. Just be warned that younger kids might get a bit bored during the talks. One thing we always try and include on our family trips is animals, be it a farm or zoo. And in Cork you have the wonderful Fota Wildlife Park. 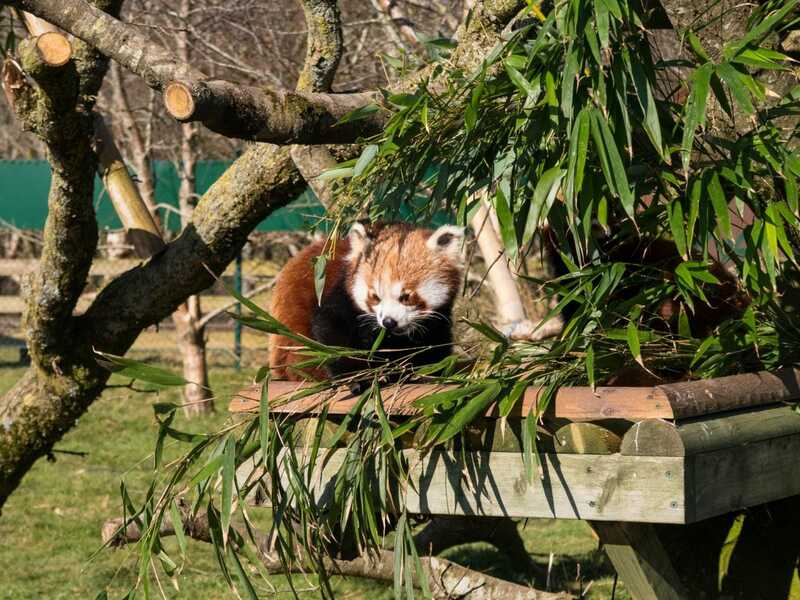 Set on a hundred acres on the island of Fota in the heart of Cork Harbour, this wildlife park is the perfect place to enjoy a day out with the kids and to even get up-close-and-personal with some free-roaming wildlife. Fota Wildlife has it all. From zebras, ostrich and cheetahs, to red panda, tigers and giraffes, there is an abundance of wildlife to spot and enjoy. There are even free-roaming animals such as the magnificent peacocks, wallabys and mara, which are large relatives of guinea pigs commonly found in Argentina and other areas of South America. The areas they roam are marked on the map you get as you enter. You just need to keep your eyes peeled for them as they are literally roaming free around the park. If you have a train fan, then try and catch a ride on the Zoo train which takes you around the park. We didn’t know about it until we’d completed our circuit, at which time we were getting ready to leave. Be warned, the signs in Fota Wildlife Park suggest an anti-clockwise route which is fine, but the train leaves from just to the left of the entrance. So, although you head right if following the signs, if you want to catch the train, go left at the entrance. Fota Wildlife Park is a great family day out in Cork, I highly recommend it, and you’ll easily spend a couple of hours there. We did one circuit of the park and with two four-year olds in tow, it took us nearly fours hours to complete it, with one pit stop for snacks and a cup of tea. There is a large playground towards the rear of the park which the kids thoroughly enjoyed. My top tip for visiting Fota Wildlife with Kids is to bring a buggy, even if you think they won’t need it. Sweets and bribes were how we completed the last section of the park. The highlight of our time in Cork is most definitely our visit to Blarney Castle and Gardens. I have wanted to visit Blarney Castle for a long time and knew that it would be on our road trip list of must-dos. 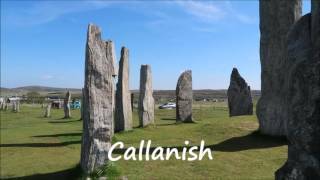 It was one of those tourist attractions that I took for granted while living in Ireland but sorely regretted not visiting for many years. 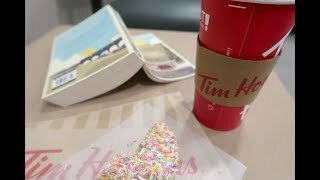 Now that we were returning and going to be in the area, it was a regret I was going to change. We planned our visit on our last day in Cork, before heading back to Dublin, and we timed our visit perfectly. We arrived shortly after opening and made our way straight to the castle to climb the 100+ steps to the top for a very good reason; so I could kiss the Blarney Stone. There were only a few people in front of us on the stairs and a short queue at the top to kiss one of the most famous stones in the world. It is said that if you kiss the Blarney Stone you will be bestowed with the gift of the gab. Both the kids were much too young to do it, and my sister didn’t want to do the backwards flip in order to reach it, so it was down to me to do it for us all. And I am glad to say that’s another thing off the bucket list ticked. Kids must be eight years old before they will be allowed to kiss the stone. And a word of warning. There is a photographer at the top who takes your picture for you. You can, of course, get someone to take some for you as well. You are given a ticket to view and then purchase your official picture afterwards. However, the photographs MUST be collected at the shop at the bottom of the castle and NOT in the gift shop at the entrance to the site as we mistakenly thought. So, as a result, I don’t have photographic evidence of my kiss as my sister was holding onto the kid’s hands. So, a return trip is in order in a few years’ time when our son is old enough to kiss the stone as well. After we’d viewed some of the rooms in the castle on our descent, we made our way into the gardens of Blarney Castle. We only explored the right-hand set of gardens as we were a bit pushed for time. We saw the poison garden, which is home to poisonous plants such as foxglove and wolfsbane. We also wandered into the area housing camellia trees which were in bloom. They were stunning. We also found one of the two waterfalls that lie within the gardens of Blarney Castle. It was beautiful and the perfect place for a teddy bear hunt for the kids. 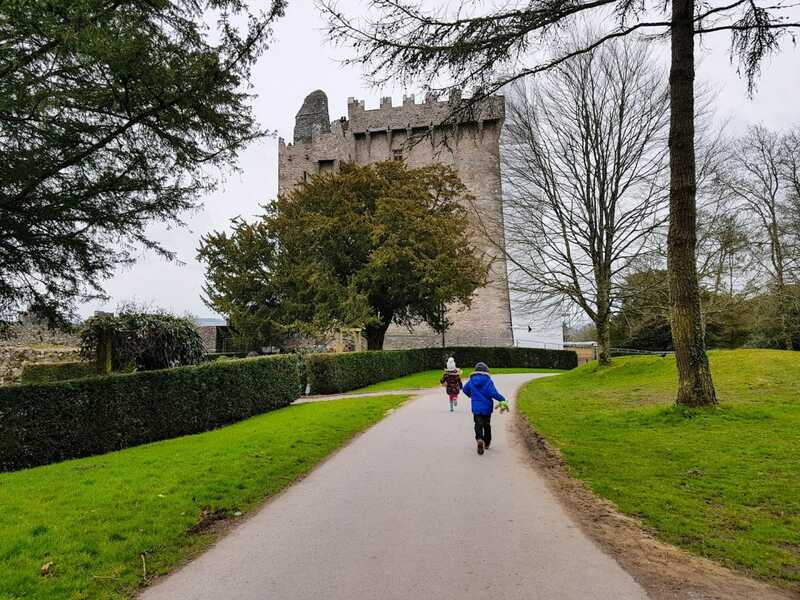 We spent about three hours at Blarney Castle and didn’t cover it all, so I would allow yourself a full day there if you plan to visit the castle and explore both sides of the gardens. I’ll definitely be returning in the future. My top tip for Blarney Castle is to get there early. Not only will you score yourself parking, but you’ll also hopefully miss most of the tour buses. As we were leaving there were a lot more visitors arriving, and we passed a number of tour buses as we left the car park. So, get there as early as possible and head straight into the castle if you plan on kissing the Blarney Stone. 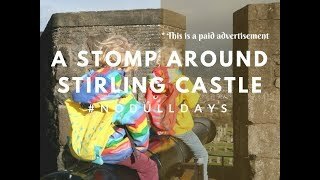 It is a great day out for families in the Cork area and our two four-year olds managed the stairs of the castle with no problems. They do get quite narrow near the top so just watch your footing. And of course, the gardens are the perfect place for kids to run free and explore. Just keep a watchful eye on them if you are in the poison garden. I highly recommend you visit Blarney if you are ever in Cork. And make time to kiss that stone. 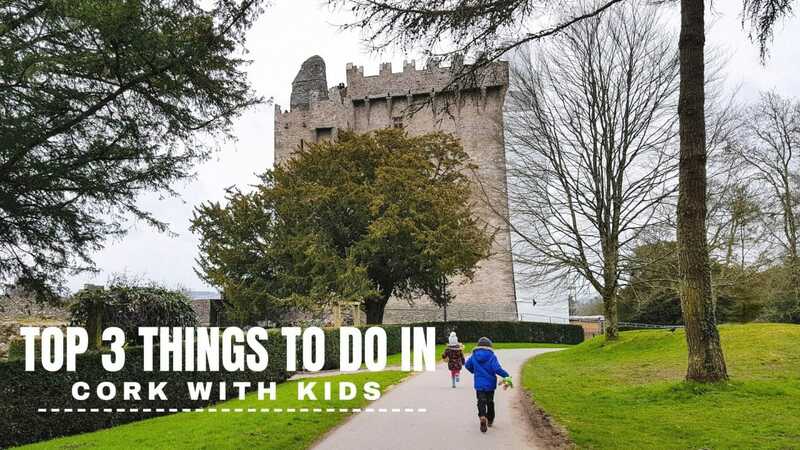 These are the top three things we enjoyed with kids in Cork, Ireland and can wholeheartedly recommend them for families. Each has something different to offer and can be enjoyed by families with children of all ages. Parts of the two castles are not accessible to buggies, for obvious reasons, but can still be enjoyed if you have a baby-carrier. And both Fota Wildlife and Blarney Castle have playgrounds and open spaces for kids to enjoy.